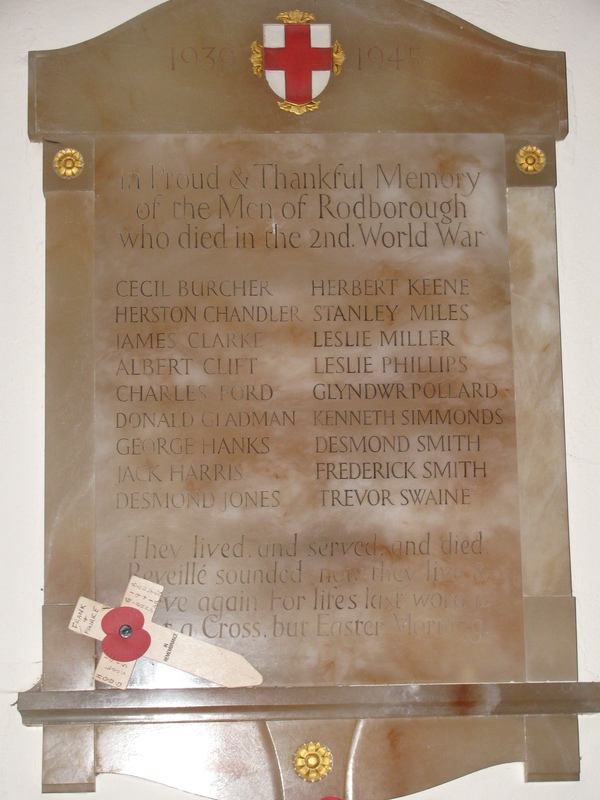 Rodborough’s First World War Memorial is located on the north wall inside St. Mary Magdalene Church, off Walkley Hill, Rodborough, Stroud. It records the names of 60 men of the parish who lost their lives in the Great War 1914-1918. Five of those names were added to the base at a later date. 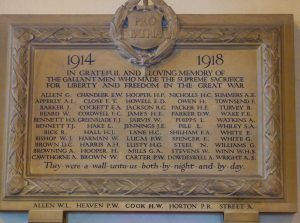 The memorial was created for the parish by local monumental masons Freebury & Hillman Ltd. of Stroud who made many others in the area and also contributed masonry for the Menin Gate memorial to the missing in Belgium. The memorial tablet cost £62, funded by public subscription and was unveiled in November 1920. There was a little surplus money and this was used to buy the wooden font lid. If you look carefully, you will see the inscribed brass plaque. In the Lady Chapel the window was given by Frederick and Mary Ann Steel in commemoration of their son Norman and other Rodborough men killed in the First World War. 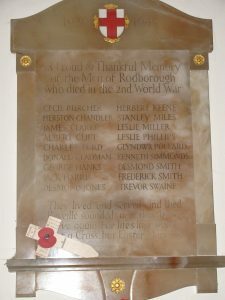 The memorial tablet to those sacrificed in the Second World War is on the south wall of the church. They lived and served and died: Reveille sounded, now they live and serve again. For life’s last word is not a Cross but Easter Morning. We are interested in collecting information about the men mentioned on the WW2 memorial and also about anyone else who served in WW2 – please do contact us if you have any information about anyone and would like to contribute it.